Mies van der Rohe, Mansion House Square, Unbuilt design. THERE ARE TWO JUBILANT MOMENTS in “Mies van der Rohe + James Stirling: Circling the Square” at the Royal Incorporation of British Architects’ (RIBA) Architecture Gallery in London, but they are easy to miss, even in a show as small as this one. Both pertain to Mies’s plans in the 1960s to erect a nineteen-story office high-rise on a central site in the City of London, and both are represented by ephemera that suggest the slow rise and precipitous fall of the ill-fated project. The first piece is a quick sketch of an inverted pyramid of champagne glasses, made by the architect’s grandson Dirk Lohan to celebrate the ostensible approval of the project in May 1969, just a few months before Mies’s death. 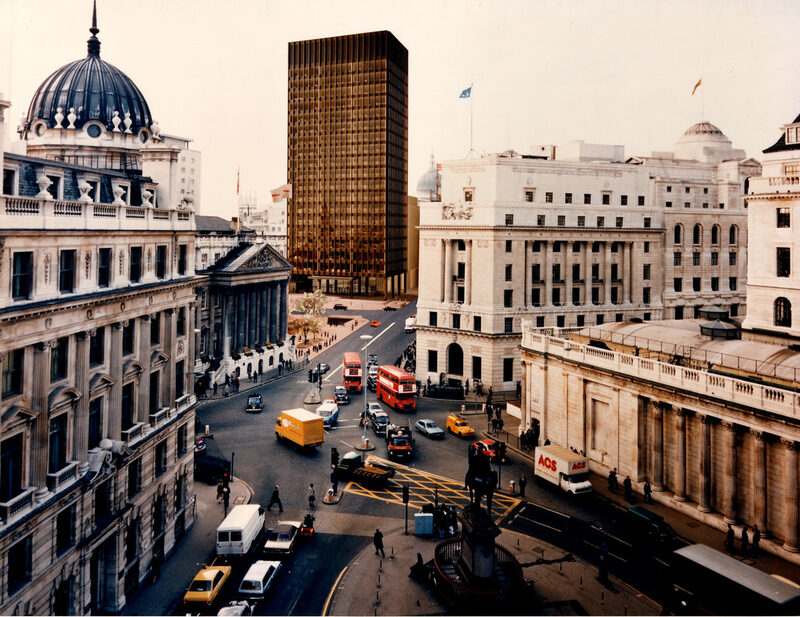 Dubbed Mansion House Square, after the large public plaza Mies proposed to place opposite his building, the bronze skyscraper would have stood just a few hundred feet from Saint Paul’s and would have had a profound affect on the development of the London skyline. The second is a press clipping from 1985, which metaphorically tells of a second spumante-fueled celebration: this one by the project’s opponents, who definitively stopped the project later that year. Mies’s vanquishers included several high-profile antagonists: the arch-contrarian and trend-chaser Philip Johnson; the bumptious scion the Prince of Wales; and reportedly even Margaret Thatcher herself. His design was also, it would seem, a victim of the shifting winds of architectural fashion—by the early 1980s, thanks in no small part to people like Johnson and the prince, postmodernism was replacing Mies’s sleek modernism (and the very un-Miesian clamor of Brutalism) as the preferred style of corporations worldwide. Accordingly, James Stirling was chosen in 1986 to design a building for the site, and his low-slung and immoderate, if imaginative, No. 1 Poultry was constructed in lieu of Mies’s troubled tower in 1997. James Stirling, Michael Wilford, and Associates, Number One Poultry, 1997. The story of “Circling the Square,” which is recounted largely through archival documents, drawings, and a few scale models, maps neatly onto this modernism–postmodernism continuum. There is a feeling of historical inevitability about the telling as well as an off-the-cuffness in the way entire epochal shifts seem to have been set in motion by squabbling personalities. The visitor quickly encounters a scrum of illustrious architects, not just Mies and Stirling, but also Berthold Lubetkin, Denys Lasdun, and Richard Rogers, among others. Their signatures appear on letters of support solicited by the Mansion House Square’s developer Lord Peter Palumbo, who, by the early 1980s, was finding the climate increasingly hostile to his plans. In order to lay the ground for the project, Palumbo intended to flatten several Victorian office buildings, barely a notable one among them. What they did have going for them, however, was their unequivocal Englishness, a highly trafficked commodity in Thatcherite Britain, when conservatism had triumphed and modernity—Miesian and otherwise—was in retreat. In the face of withering criticism, Palumbo eventually conceded defeat and scaled down his vision. In tapping Stirling, a talented eclectic, for the job, Palumbo opted for an architectural statement more in line with the mood of the time. Once deemed elegant, Mies’s design had come to be seen as pugnacious. The “target,” it seemed, was the neoclassical bastions—the Bank of England, the Royal Exchange—that define the City of London’s amaranthine character. Where the newspaper columns had feted Mies upon a visit in 1967, they had, by the mid-1980s, swayed in the opposite direction. “Attitudes have changed since Mies conceived the design 20 years ago,” the Times asserted. “Lessons have been learnt about how cities work.” The wisdom of “learning from” was typical of the period, at the same moment when the right to the city was being curtailed. The sober platonic geometries and obsessive spatial investigations of Mies’s generation were discarded for riotous levels of surface effects stemming from a deeply unfounded optimism. Not the optimism of technology, nor the optimism of any pronounced collective will. Instead, this was the delirium of deregulation, a manic belief in consumer choice and positive thinking. How freeing it was to not have to think about society’s course. What a relief it was to ditch the future. Every project offered something effervescently new, and for that reason, they were all equally disposable. Mies, the most po-faced of builders, must have seemed a fossil to the protagonists of this new zeitgeist. Indeed, the Times article was accompanied by an illustration depicting a diminutive Mansion House Square mounted on a museum display; exhibited alongside a dinosaur skeleton, it was drolly labeled “Pre-Palumbian.” Not only had the figure of the architect within society shifted (it was ultimately diminished), corporations, too, had changed. Mies had been the architect of capitalism with a human face. The Chicago housing developer Herb Greenwald, Mies’s devoted benefactor, and Phyllis Lambert, the whiskey heiress who commissioned the architect to design the Seagram Company’s Park Avenue headquarters in New York, were representative of this slightly less rapacious bourgeoisie, which made it a point to invest in high culture. With the advent of Thatcher and the dismantlement of the postwar compromise, the velvet gloves had come off and capitalists grew bolder in their avarice, aesthetics included. At the RIBA, it is easy to appreciate the clarity of Mies’s plan, and it is obvious that the master attended closely to its development. Having visited London twice, Mies was not, contra the naysayers, insensitive to place, and the curators point out the ways in which he reworked the exact placement of the tower several times. No detail was left unresolved, a fact colorfully demonstrated by two large models situated at the exhibition’s gravitational center. Mies even concerned himself with the positioning of a flagpole, meant to punctuate the capacious public plaza, which would have been the largest in London. In the end, though, the overemphasis on Mies is misguided. The tragic leading man has been miscast; it is not Mies’s Passion but Palumbo’s. Palumbo’s father had a great hand in reshaping postwar London, making gobs of money developing bombed-out sites all over the city. Palumbo the Younger had been primed to take over the family business, but he was more than anything else a connoisseur-collector. While still in his thirties, he had acquired a string of modernist homes, including, in 1972, Mies’s Farnsworth House, a jewel box for living (or lounging) in. The Miesian corpus inspires a kind of fetish and that is what certainly impelled Palumbo to seek out the architect. With family lands and a locked-in tenant, the Lloyd’s Insurance Company, he plotted the ultimate monument to his pet hobby. Mansion Square House gave him the chance to act out the role of cultured patron, a Medici, steward of the sublime architectural object. Mies’s death did not dissuade him, as he had had the foresight to obtain from the architect a complete set of building drawings, down to the design of the door handles. One can read in Palumbo’s dedication an abiding fanboyism. He paid dearly for it, sinking millions of pounds into the Mansion House Square project. Lloyd’s had long since recused itself; it was to later take up quarters in the unrepentantly futuristic skyscraper Richard Rogers built for it in 1986 elsewhere in the city. Even so, it may have been poor Stirling who got the very worst of it. The second half of “Circling the Square” unspools the design process behind No. 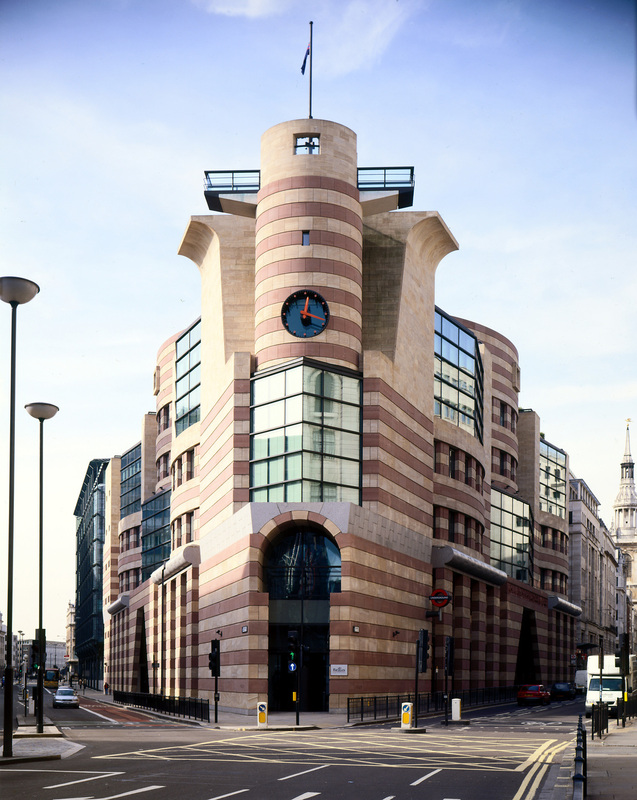 1 Poultry, a stony mishmash of vague referents. A brilliant series of graphite-and-ink drawings illustrates the attention Stirling’s office paid to each element of the design. These were poured over, primped, and carefully modulated to achieve just the right effect. Contextualism was a starting point, not an unwelcome imposition. Yet the success of the end result is debatable, and even at the time the project was proposed, it drew harsh and very public criticism, including, ironically, from some of the same figures who had opposed Mies’s alienating proposal—among them the prince, who complained that it looked like an “old 1930s wireless.” Under duress, Stirling threatened to return his Royal Gold Medal for Architecture, which had been granted to him by the Queen. More seriously, he pondered relocating to America. He did neither and died in 1992, five years before No. 1 Poultry was opened. Today, when visiting No. 1 Poultry and the surrounding area, there’s little indication that this was once hotly contested terrain. Across the way, Bloomberg’s European headquarters is nearing completion. Designed by that gentle baron Norman Foster, the building is carefully integrated into the surrounding streetscape. Foster is mindful of the context and has permitted himself the use of “historic devices”—namely, English sandstone—while making up the innovation deficit with huge grooved-glass window panes fabricated in China. “It’s all about values, what is appropriate, respectful, fitting in in terms of the City,” he has said of the project. There is no longer any pretense of artful mastery, nor much authorial intent. Power resides ineluctably with the same institutions, but only now the architect is intimately familiar with the boundary walls of the playpen. Seamless integration and continuity are all he hopes for. Easily granted. Sammy Medina is a writer based in New York.